Dry Roast Coriander Seeds and Cumin Seeds. Cool Down Completely. Soak Cashews and Poppy seeds in water for 15 minutes. Add dry roasted Cumin Seeds and Coiander Seeds, Coconut, Green Cillis, Soaked Cashws and Poppy seeds into a blender and blend them well into a paste. Heat oil in a frying Pan. Add the Bay Leaves, Cinnamon, Cloves, Black Stone Flower, Star anise and saute until nice aroma comes out. Add in Chopped onion and saute until glossy. Add in ginger garlic paste and saute in until it cooks well. 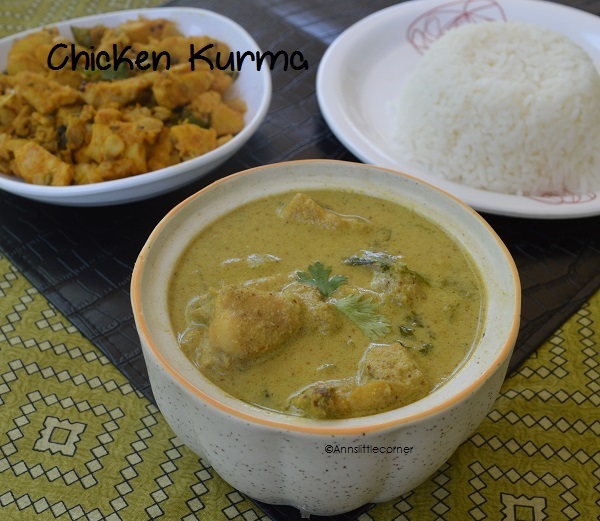 Add in the washed and cleaned chicken pieces add in required water, turmeric powder and salt to taste and start cooking them. Keep cooking until the chicken pieces are tender. Add in the ground paste mix them well. Keep cooking until the mixture cooks well. Add in the curd and cook in low flame for 3 minutes. Garnish with Coriander leaves. 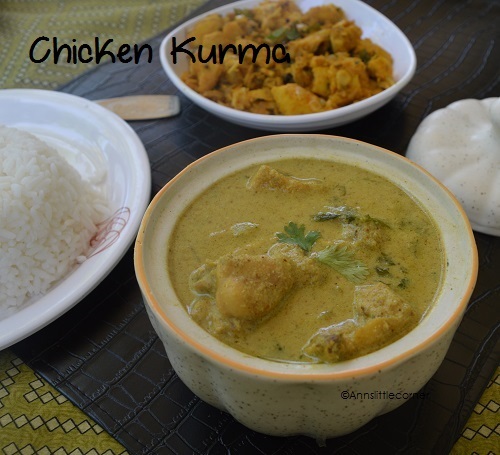 Delicious Chicken kurma is now ready to serve. 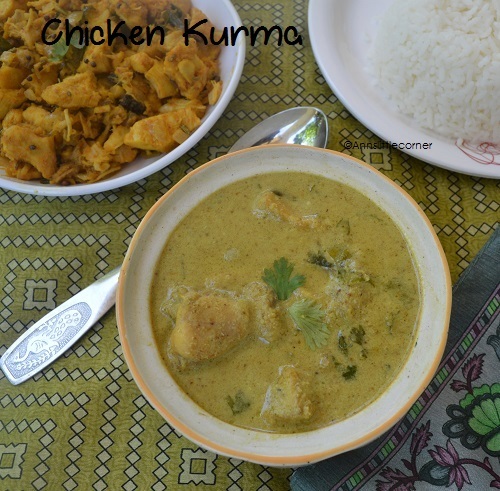 My Personal favourite is serving Chicken Kurma with Muslim Style Ghee Rice. It also goes well with Biryani, Pulao, Roti, idli, Dosa, Appam, Idiyappam and even with bread..